It is such a great little dish I wanted to share it with you again. While it is heating up, cut your avocados in half lengthwise, remove the stone, and give a quick spritz of lemon on the flesh sides to avert oxidation (the lovely green flesh turning murky brown). Set aside. Cut the lemons in half width-wise, then set aside. Optional: give a very quick spritz of extra-virgin cold-pressed olive oil on the avocado flesh. 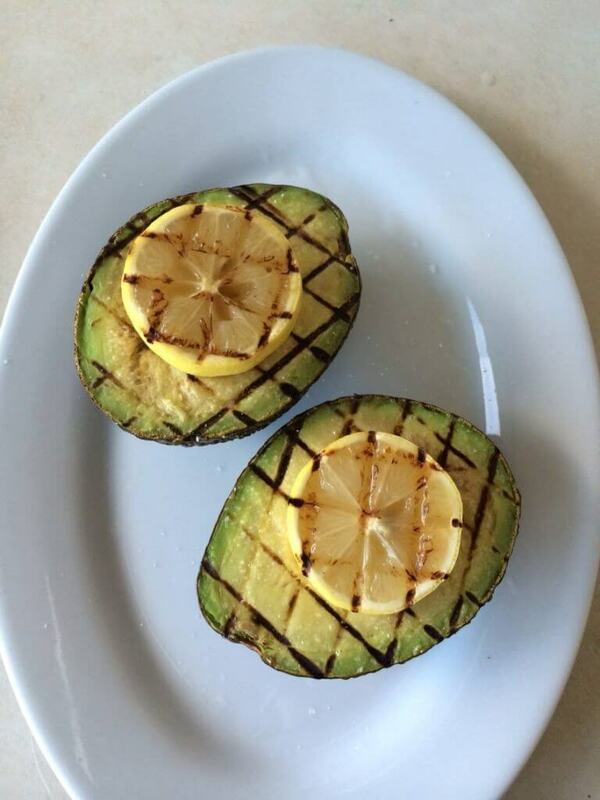 Place avocados flesh side down, and lightly press them into the grill grates without smushing them. You want to retain the integrity of their flesh and their exocarp (formal name for their skin). Leave them alone. After a minute or two, very gently try to pick up the avocado from the grill. If you feel any resistance whosoever, STOP. Wait another minute or so. The avocado should very easily be able to be lifted off the grill, and you will have lovely grill marks. Now, put the avocado back on the grill, cross-hatching it 90 degrees, and repeat the process. When you lift the avocado, it should look just like mine. You can give it a quick spritz of lemon as well as a light sprinkle of salt. When I want to be truly decadent, I will use black truffle sea salt. Place on a platter so you are proudly showing off your grill marks. Repeat this same process with the lemons. When they are done, place one in each of the avocados stone wells. To eat, you can serve them immediately, leave them out at room temperature, or park in the refrigerator to serve later (however, I recommend that you remove them from the refrigerator about an hour or so before you want to eat them to bring them back to room temperature. To eat, serve with a small cappuccino spoon (my favorite way to eat them) or a teaspoon. Dig in. This is my absolute favorite way to eat them, straight out of the skin. You can roughly chop the avocados and make a chunky salsa; place the chopped avocado atop a glorious baby spinach salad with dried cranberries, thinly-sliced pickled red onions, some toasted nuts, with a dressing of your choice, garnish your favorites tacos, or serve on an antipasti with roasted eggplant and capers, caramelized carrots, burgundy mushrooms, etc.